Univa Grid Engine Container Edition features the unique ability to run containers at scale and blend containers with other workloads supporting heterogeneous applications and technology environments. Docker containers are being rapidly adopted by developer communities and provide a more responsive and efficient method to develop, modernize and release applications. IT operations managers want to incorporate containers within their production systems but require proven orchestration and scheduling software as well as configuration tools. Running Docker containers in a Grid Engine cluster fulfills these needs. In all these valuable comparisons about strengths and weaknesses of containers and related technologies one fact should be taken into account: Docker has been developed (starting 6 years ago!) mainly with enterprise micro-services based applications in mind. 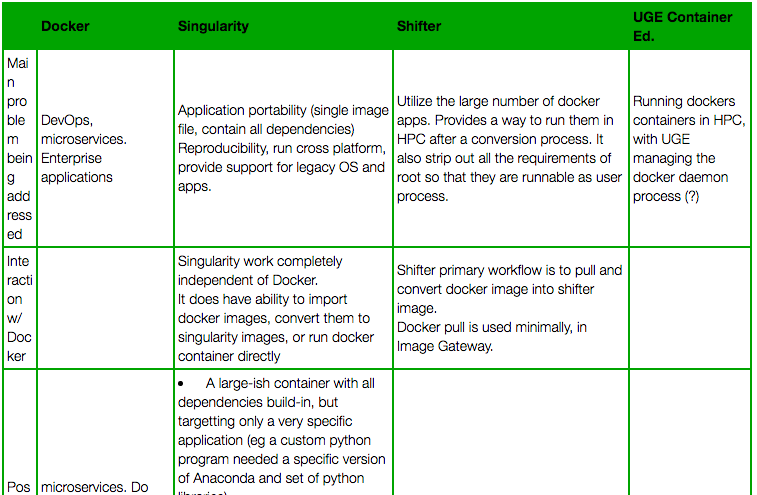 Now when comparing Docker with Shifter and Singularity which both (recently) have been developed from the start off with HPC applications in mind it might be fair to include in such a comparison an HPC enhanced version of Docker which is able to handle MPI, Infiniband, GPU, remote HD viz, etc. One such version is the (HPC-enhanced) UberCloud Container based on Docker which is running on clouds since early 2015 like AWS, Azure, Atos, Advania, OzenCloud, CPU 24/7, Nephoscale, and others, and which hosts application software from ANSYS, CD-adapco/Siemens, OpenFOAM, Numeca, COMSOL, and more.